Octopath Traveler has received quite a bit of criticism for its by-the-book storytelling and shallow characters. I’m not nearly far enough into the game to comment on these points, and I would be beating an already pulverized and very dead horse if I were to do so. What I can say is that the aesthetic aspects of the game are breathtaking. The visuals, the music, the sound design, all of these “shallow” components of the game make it feel like something special, even if it ends up failing to live up to that feeling. Just… look at that. I know, people have praised this game’s visual style countless times by now, but I will never get over how amazing it looks. 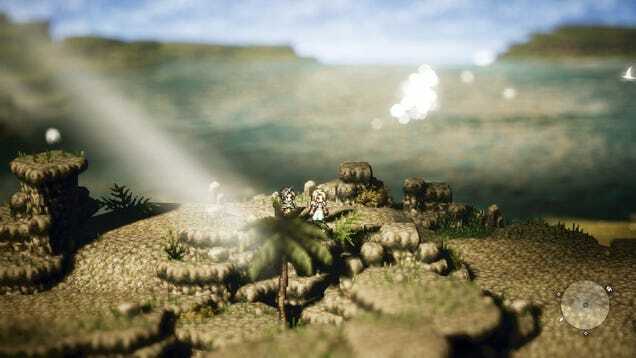 The lively sprite work and detailed backgrounds are on par with classics like Chrono Trigger and Final Fantasy VI, but the modern twists like the variable focus and impeccable lighting cement Octopath Traveler’s style as both unique and groundbreaking. Every environment makes me shudder with glee, and beckons for me to explore more of the gorgeous world. The music and sound design are no slouches either. The soundtrack can be bombastic, eerily subtle, or heartwarming as need be. Every track that I’ve heard so far is memorable. More importantly than that though, the sound effects that this game has to offer are incredibly satisfying. These effects make the simple act of casting a spell, breaking an enemy’s guard, or leveling up feel like a titanic achievement. Every action in the game has a definitive weight to it that is created by punchy and well-constructed sound effects. It may seem silly, but the load of the more repetitive aspects of the game is lightened substantially by the continual satisfaction provided by these sounds. It would not be an exaggeration to say that I bought this game purely for how it looks and sounds. I had my doubts about the combat and writing from what I’d seen, but I could not resist the powerful allure of the surface level details in this beautiful game. While I cannot speak for the longevity of the entertainment it provides, I can guarantee that I will not be tiring of Octopath Traveler’s aesthetic appeal for a long while.